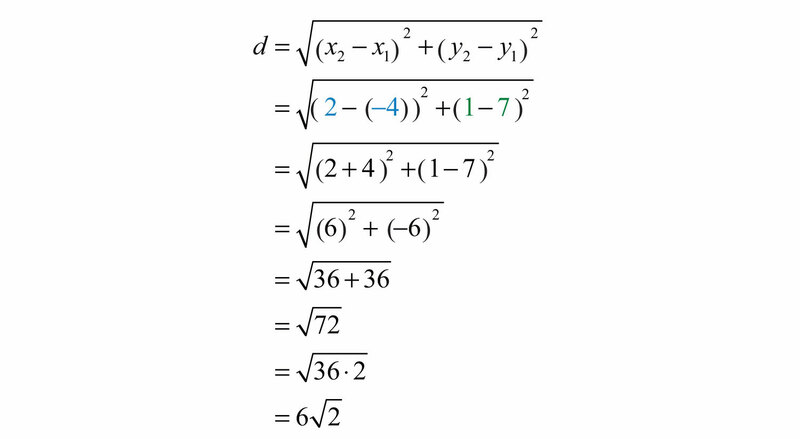 This is “Radical Expressions and Equations”, chapter 8 from the book Beginning Algebra (v. 1.0). For details on it (including licensing), click here. Simplify expressions using the product and quotient rules for radicals. The square rootThe number that, when multiplied by itself, yields the original number. of a number is that number that when multiplied by itself yields the original number. For example, 4 is a square root of 16, because 4 2 =16. Since ( −4 ) 2 =16, we can say that −4 is a square root of 16 as well. Every positive real number has two square roots, one positive and one negative. 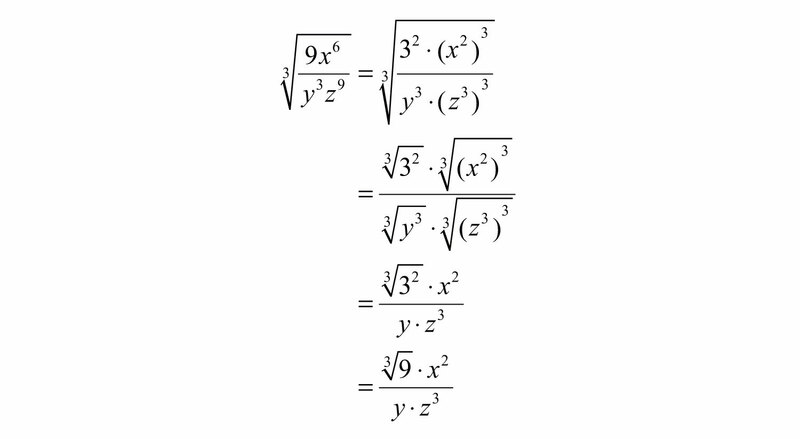 For this reason, we use the radical sign to denote the principal (nonnegative) square rootThe positive square root of a real number, denoted with the symbol . and a negative sign in front of the radical − to denote the negative square root. Zero is the only real number with one square root. Example 1: Find the square root. Example 2: Find the negative square root. The radicand may not always be a perfect square. If a positive integer is not a perfect square, then its square root will be irrational. 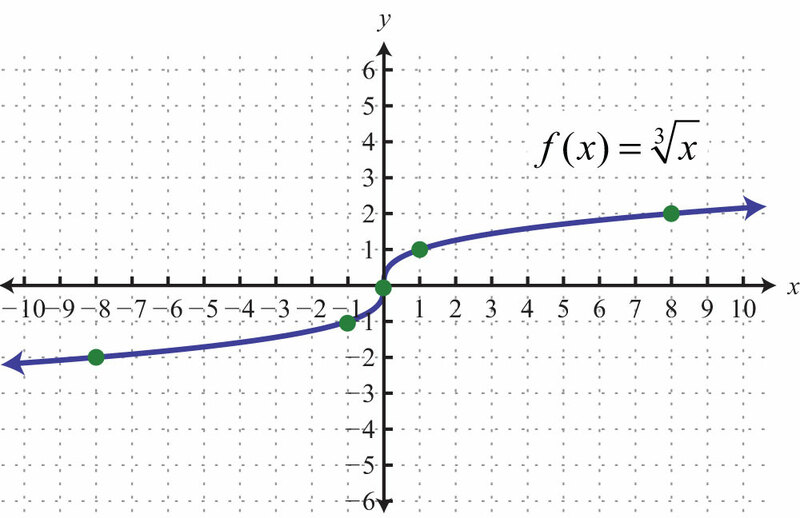 For example, 2 is an irrational number and can be approximated on most calculators using the square root button. The square root of a negative number is currently left undefined. For now, we will state that −9 is not a real a number. 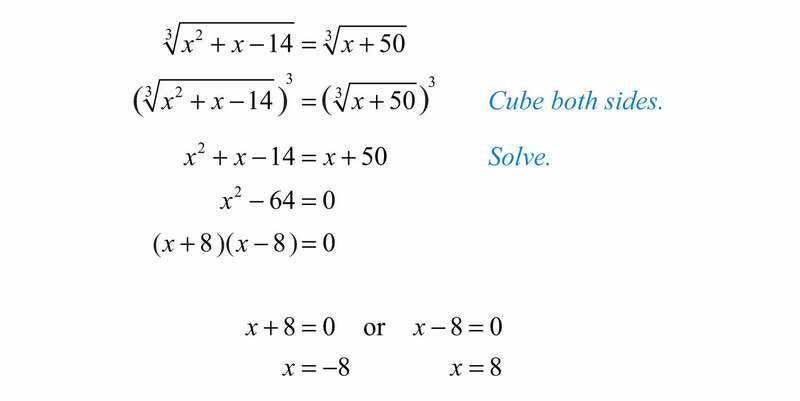 When simplifying cube roots, look for factors that are perfect cubes. 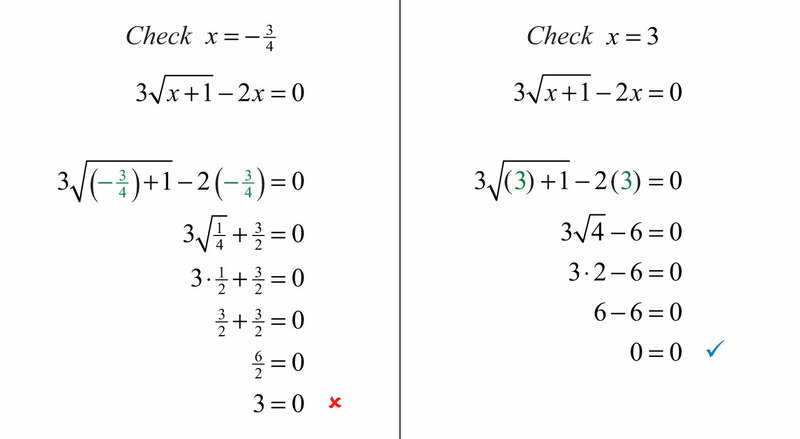 Example 3: Find the cube root. 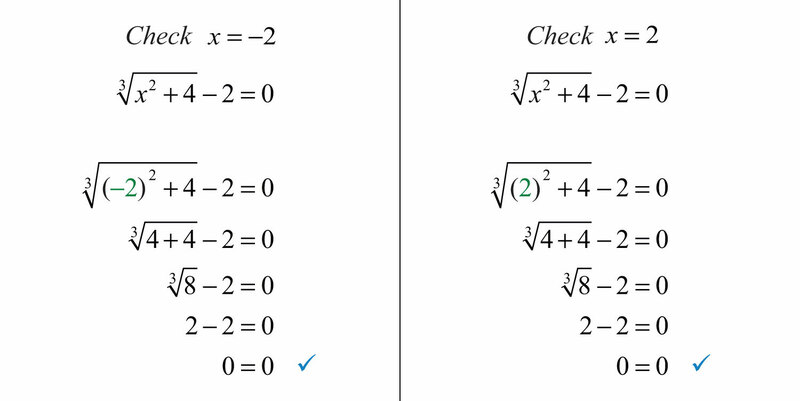 Example 4: Find the cube root. Here n is called the index and an is called the radicand. Furthermore, we can refer to the entire expression an as a radicalUsed when referring to an expression of the form an.. When the index is an integer greater than 3, we say “fourth root”, “fifth root”, and so on. 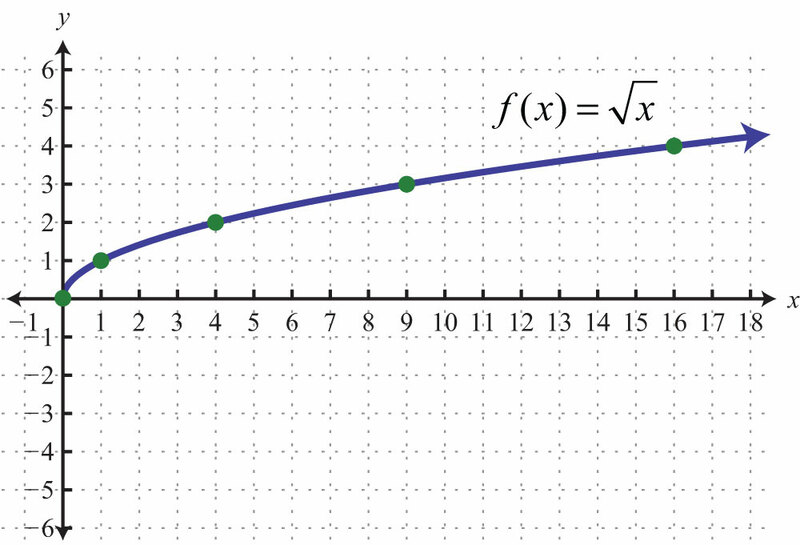 The nth root of any number is apparent if we can write the radicand with an exponent equal to the index. 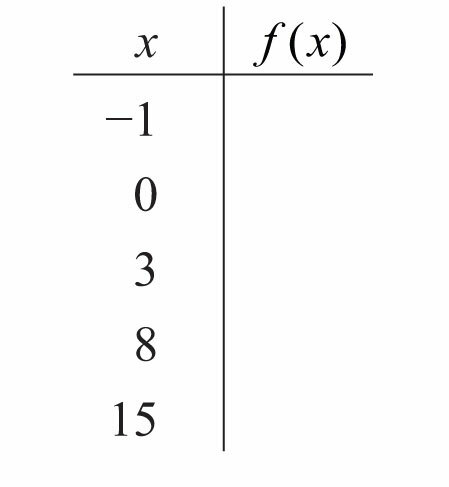 Example 5: Find the nth root. The negative nth root, when n is even, will be denoted using a negative sign in front of the radical − n.
Here the fourth root of −81 is not a real number because the fourth power of any real number is always positive. a. The radicand is negative and the index is even. Therefore, there is no real number that when raised to the fourth power is −16. 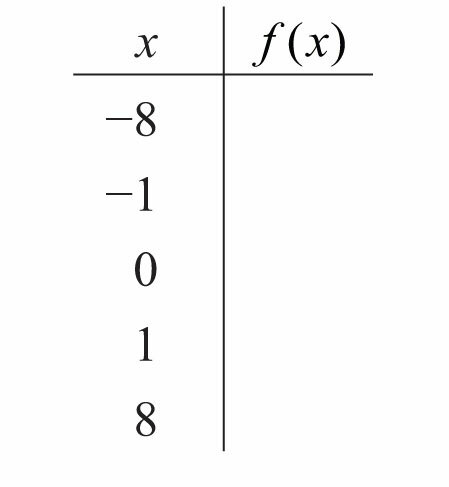 Example 7: Find the nth root. Try this! Find the fourth root: 6254. Summary: When n is odd, the nth root is positive or negative depending on the sign of the radicand. When n is even, the nth root is positive or not real depending on the sign of the radicand. A radical is simplifiedA radical where the radicand does not consist of any factor that can be written as a perfect power of the index. if it does not contain any factor that can be written as a perfect power of the index. Solution: Here 12 can be written as 4 ⋅ 3, where 4 is a perfect square. Solution: Begin by finding the largest perfect square factor of 135. 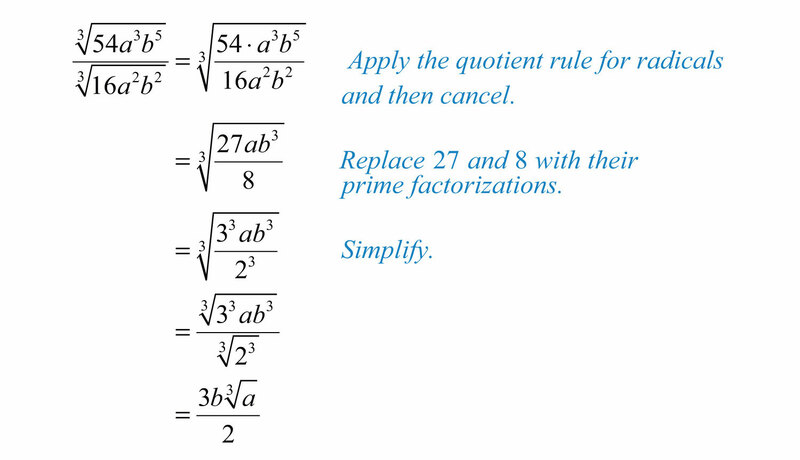 Solution: Begin by finding the prime factorizations of both 50 and 121. This will enable us to easily determine the largest perfect square factors. Replace the radicand with this factorization and then apply the product rule for radicals. We can verify our answer on a calculator. Try this! Simplify: 2 963. 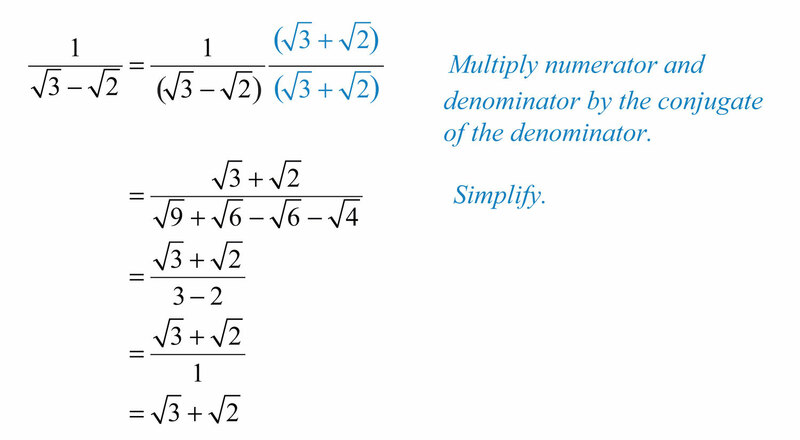 Solution: In this case, consider the equivalent fraction with −8=(−2)3 in the numerator and then simplify. The square root of a number is that number that when multiplied by itself yields the original number. When the radicand a is positive, a2=a. When the radicand is negative, the result is not a real number. The cube root of a number is that number that when used as a factor with itself three times yields the original number. The cube root may be positive or negative depending on the sign of the radicand. Therefore, for any real number a, we have the property a33=a. When working with nth roots, n determines the definition that applies. We use ann=a when n is odd and ann=|a| when n is even. When n is even, the negative nth root is denoted with a negative sign in front of the radical sign. To simplify square roots, look for the largest perfect square factor of the radicand and then apply the product or quotient rule for radicals. 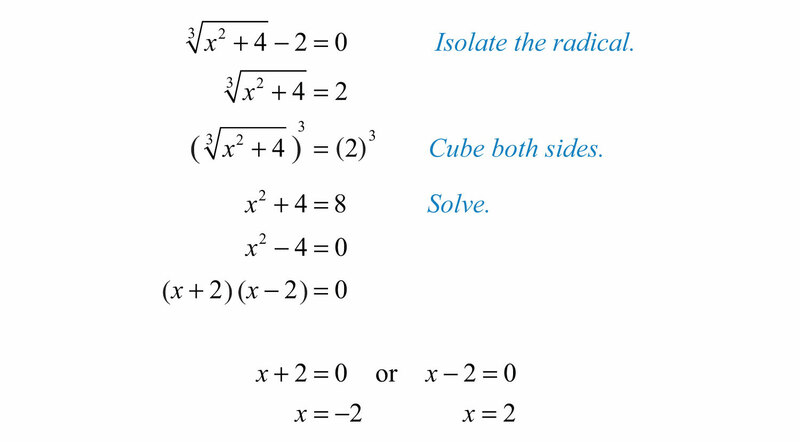 To simplify cube roots, look for the largest perfect cube factor of the radicand and then apply the product or quotient rule for radicals. 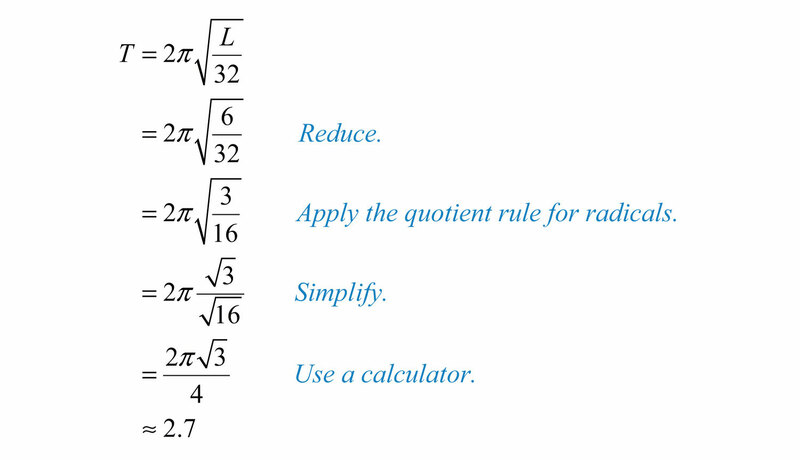 To simplify nth roots, look for the factors that have a power that is equal to the index n and then apply the product or quotient rule for radicals. Typically, the process is streamlined if you work with the prime factorization of the radicand. Simplify. 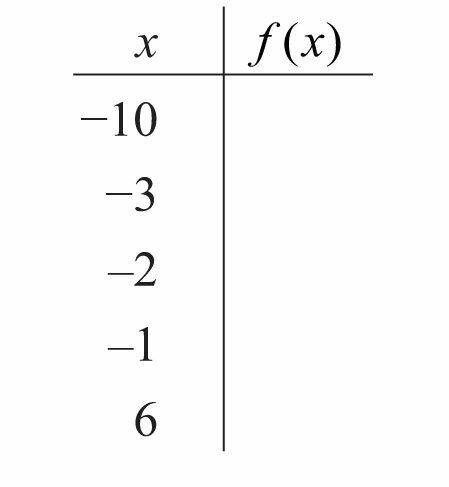 Give the exact answer and the approximate answer rounded to the nearest hundredth. 121. The formula for the area A of a square is A=s2. If the area is 18 square units, then what is the length of each side? 122. Calculate the length of a side of a square with an area of 60 square centimeters. 123. The formula for the volume V of a cube is V=s3. If the volume of a cube is 112 cubic units, then what is the length of each side? 124. Calculate the length of a side of a cube with a volume of 54 cubic centimeters. 125. Explain why there are two square roots for any nonzero real number. 126. Explain why there is only one cube root for any real number. 127. What is the square root of 1, and what is the cube root of 1? Explain why. 128. 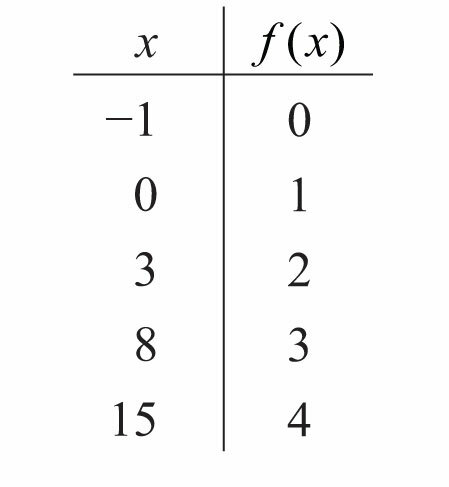 Explain why −1 is not a real number and why −13 is a real number. Add and subtract like radicals. Simplify radical expressions involving like radicals. When adding terms with like radicals, add only the coefficients; the radical part remains the same. Solution: The terms contain like radicals; therefore, add the coefficients. Subtraction is performed in a similar manner. If the radicand and the index are not exactly the same, then the radicals are not similar and we cannot combine them. We cannot simplify any further because 5 and 2 are not like radicals; the radicands are not the same. It is important to point out that 5−2≠5−2. We can verify this by calculating the value of each side with a calculator. In general, note that an±bn≠a±bn. Example 4: Simplify: 3 63+26−63−36. 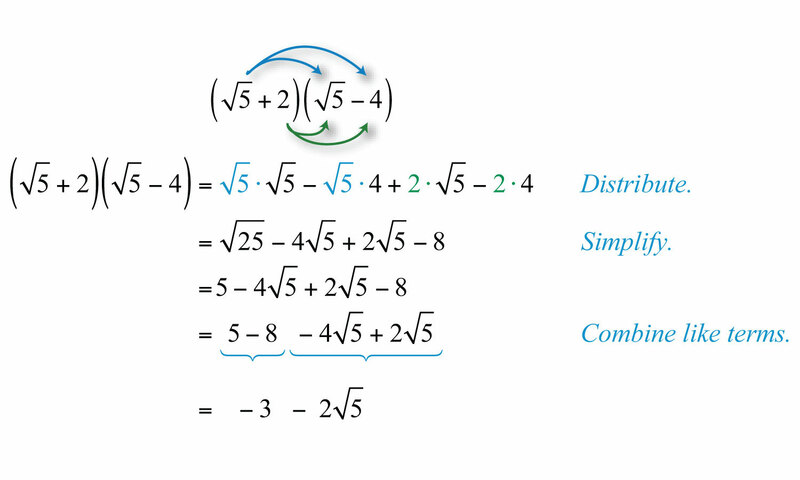 We cannot simplify any further because 63 and 6 are not like radicals; the indices are not the same. Often we will have to simplify before we can identify the like radicals within the terms. Solution: At first glance, the radicals do not appear to be similar. However, after simplifying completely, we will see that we can combine them. Next, we work with radical expressions involving variables. In this section, assume all radicands containing variable expressions are not negative. 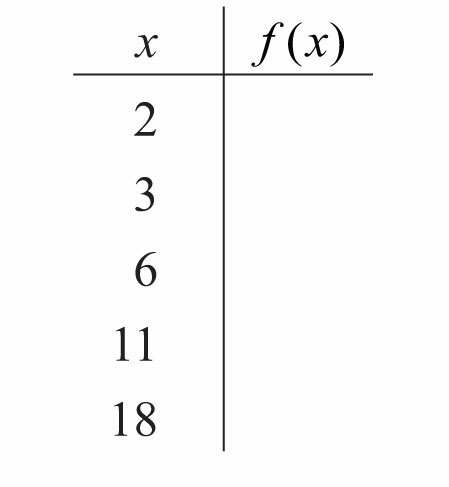 Example 7: Simplify: −6 2x3−3x3+7 2x3. We cannot combine any further because the remaining radical expressions do not share the same radicand; they are not like radicals. 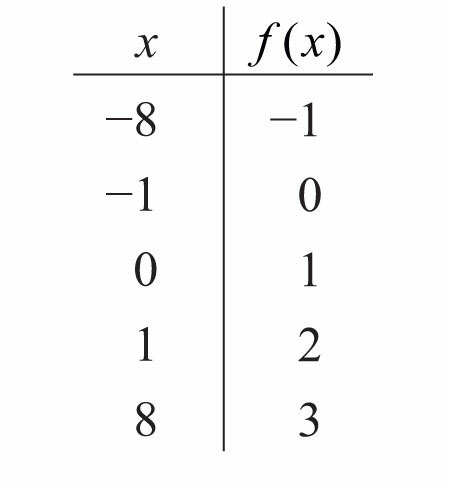 Note that 2x3−3x3≠2x−3x3. We will often find the need to subtract a radical expression with multiple terms. If this is the case, remember to apply the distributive property before combining like terms. Until we simplify, it is often unclear which terms involving radicals are similar. Example 9: Simplify: 5 2y3−(54y3−163). Take careful note of the differences between products and sums within a radical. The property a⋅bn=an⋅bn says that we can simplify radicals when the operation in the radicand is multiplication. 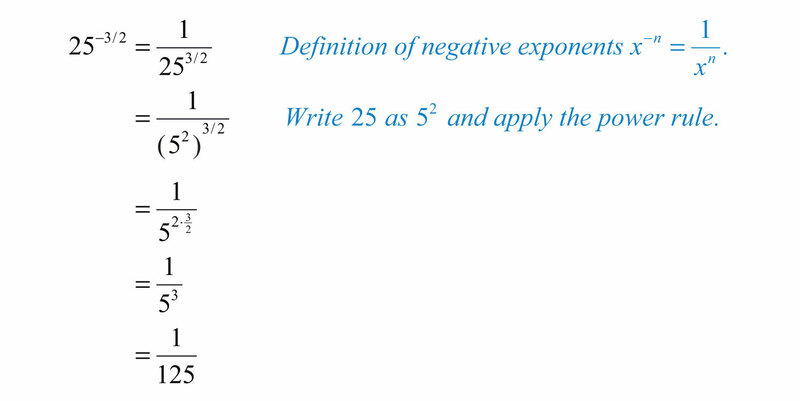 There is no corresponding property for addition. Add and subtract terms that contain like radicals just as you do like terms. If the index and radicand are exactly the same, then the radicals are similar and can be combined. This involves adding or subtracting only the coefficients; the radical part remains the same. 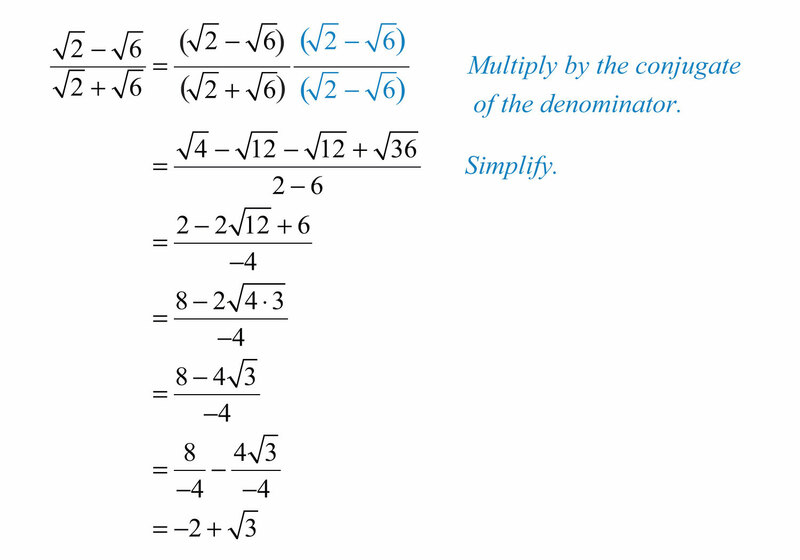 Simplify each radical completely before combining like terms. 91. Choose values for x and y and use a calculator to show that x+y≠x+y. 92. Choose values for x and y and use a calculator to show that x2+y2≠x+y.